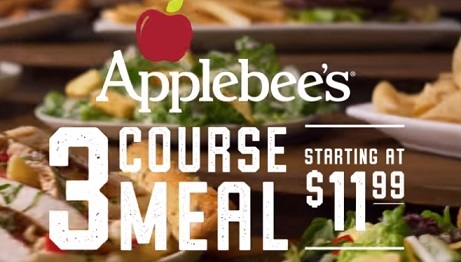 Applebee’s has released a series of new ads to announce the return of its 3-Course Meal. One of the spots, set to the tune of the 1962 hit single “Do You Love Me” by The Contours, features the mouth-watering items customers can choose as an appetizer, entrée, and side salad, for a price that starts at $11.99. Boneless Wings, cheesy Mozzarella Sticks, creamy Spinach & Artichoke Dip, and Crunchy Onion Rings are the available options as appetizers. The entrée range is wider, consisting of nine different options, such as Shrimp Wonton Stir-Fry, Classic Bacon Cheeseburger with Fries, Three-Cheese Chicken Penne, and other six that vary by location and price. When it comes to the side salad, customers can pick House or Caesar. “1. Choose a salad. 2. Choose an appetizer. 3. Choose an entrée” onscreen lines read throughout the spot, which ends with the voiceover saying “Applebee’s 3-Course Meal starting at $11.99” and adding the tagline “Now that’s Eatin’ Good in the Neighborhood”.